Be In The Next Cheapbook! 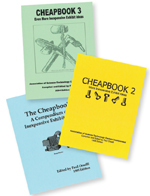 Over the years, I've been happy to have started and edited three volumes of the Cheapbooks (collections of inexpensive exhibit ideas from museum folks from around the world ) for ASTC --- the Association of Science-Technology Centers. If you don't already have or know about the Cheapbooks, the ASTC Publications Department is running a special three volume "bundle deal" right now on their website. Get the Cheapbooks even cheaper! I'm excited that ASTC has asked me to work on a fourth Cheapbook volume, which will be a little different from the previous editions, and I'd like to start gathering submissions for new exhibit "how-tos" for Cheapbook 4. So if you have a great (inexpensive) exhibit that you'd like to share with the rest of the museum world, just send me an email so I can give you more details. And stay tuned to ExhibiTricks for more details about Cheapbook 4!